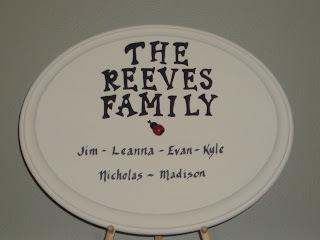 Lisa at the House of Collinsworth posted a picture of a gorgeous wooden sign she had made for her husband just a few months ago. It really caught my eye and my interest. I decided to get my creative juices flowing and made one for my husband for Christmas. Thank you for inspiring me, Lisa! That is a very cute sign. A truly wonderful family. 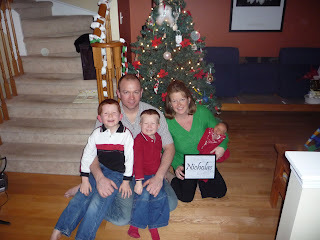 Beautiful family picture and I love the sign! Love the sign. Great job! And what a wonderful family picture. p.s. I did a sign for my husband too, one year. Mine didn't turn out as well as yours, though, my impatience got the better of me. What a wonderful idea! 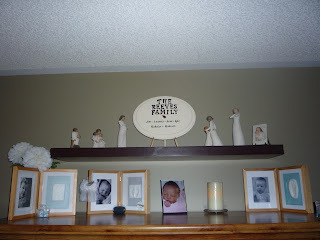 I think that I would like to make one, or have one made for our family. When you have a child/children who have passed it is so important to see their name and to hear it spoken. I love it. And I love that you have Nicholas with you in your family picture. That is quite a beautiful family, and Nicholas is as much a part of it as everyone else.